I'm a bit early this morning, got some general living going on later that would cause me not to get my last Guest Designer Spot card posted until to late in the day.The challenge this week at Creative Inspirations is: Monochrome. 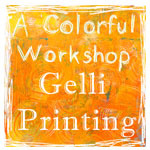 Very easy to choose one color and various shades of that color to create some stunning cards. So hop over to check out what the Design Team has come up with to inspire all of us. It's hard to believe that the month of February is almost gone. It has been so much fun having my cards featured with the rest of the Design Team on CreativeInspirations this month. One of my goals is to be on a Design Team and since I've already accomplished a couple of goals on my list I'm thinking I might get up enough courage and apply later on this year if some Design Team calls come open. Thanks to the gals at Creative Inspirations for choosing me for the month of February. My card is so appropriate for all the gloomy weather that's been going on all over the world, but as the inside says,"Blue Skies Ahead." Just a quick bit of clapping. 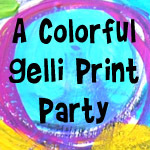 Yesterday after posting about surprises when I went over to The Play Date Cafe to enter my card in the current challenge I found out I had been picked for 1st prize from the previous challenge--Clapping--and I had won 5 sets of digi stamps from Stamps For Life over at Crazy 4 Challenges--More Clapping! The clapping is kind of for myself, but in actuallity I'm clapping for all the wonderful sponsors who generously supply these great prizes for the challenges. I'm going to enter my card in a couple of other challenges today. Pile It On! challenge for this week is Get Well Soon and even though my card doesn't say Get Well, when we're not feeling well it's still nice to hear that blue skies are ahead. Humble Pie challenge for this week is One Type of Embellishment, so my one lone little ribbon qualifies for that. Thanks again to all who come and view my artistic endeavors and leave such encouraging comments, they are very much appreciated. 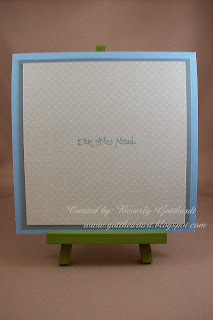 Supplies: Card Blank Blue textured card stock 5 1/4" Square, Papers: Stampin Up-Sweet Slumber Specialty Designer Series, CTMH, Stamps: Stampin Up-Font of You, Printworks-Q004 Caring Thoughts, Ink: CTMH-Z2160 Twilight, Ribbon-FX Hobby Lobby, pop dots. simple and SO very cute! love it, Bev! with regards to the comment you left - that paper on Melanie's card is the brand new Origins from BasicGrey. we're all head over heels in LOVE with it! I love this! So simple and elegant. The ribbon on the umbrella is perfect. Thanks for joining us at Humble Pie this week. This card is beautiful. Just perfect. Thank you for playing with Pile It On! this week. Hope you join us again. Stunning little simple card! Love it! Thanks for playing with us at Humble Pie! Wonderful card sweetie! Love your monochrome card! Wonderful card, Bev!! 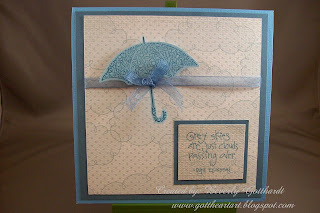 I love the blue monochromatic color scheme and I think it is perfect for a get well card with that umbrella and the cute sentiment. So happy to have you joining in the fun with Pile it On this week. Congrats on all the great recognition you've been getting lately and best of luck in your future DT bids! I think we'll be seeing you on a premier DT soon!